Since I bought my inexpensive Meike 6.5mm f2 circular fisheye for my Sony a6000 I haven’t used my Samyang/Rokinon 8mm f2.8 fisheyes at all. I love the extreme circular image I get with the Meike and I’ve been very happy with the images I get when I correct the distortion to make a more traditional rectangular image from them. But, I didn’t go as far as recommending the Meike over the Samyang/Rokinon 8mm f2.8 diagonal fisheyes. I think most surf photographers would prefer the simplicity of shooting with full diagonal coverage of their sensor. Even though the Meike costs half of the price of the Samyang/Rokinon, I think a diagonal fisheye is probably the best option for most surf photographers. So far the best value fisheye for surf photographers who use the Sony a6xxx range of bodies has been the Samyang/Rokinon 8mm. But now you have another option that’s about half the price of the Samyang/Rokinon and gives you a very similar field of view across the whole sensor. At just $139 US the 7artisans 7.5mm fisheye is now the most inexpensive diagonal fisheye for the Sony e-mount. 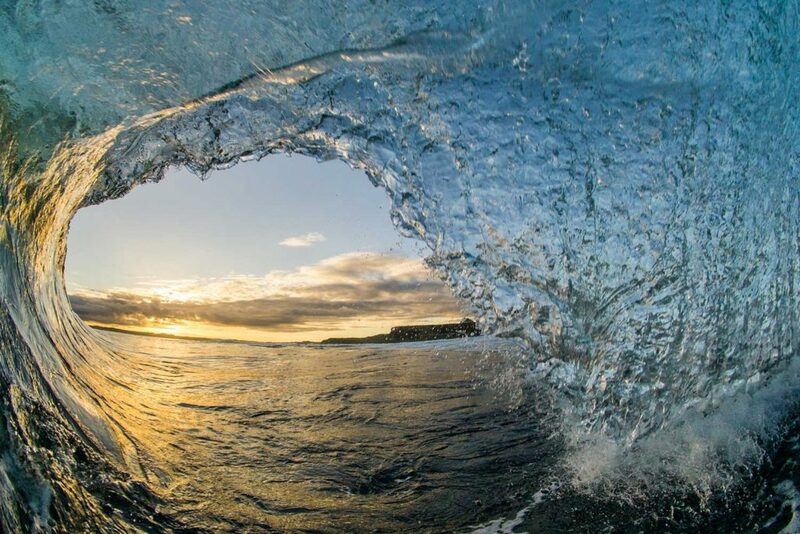 The manual aperture and focus shouldn’t worry you at all, you don’t need to autofocus on a fisheye for surf photography, and setting up the aperture to get decent shots whatever the light conditions is very easy too. The brand 7artisans is relatively new, but they’ve got a few all manual lenses available and I’ve been pretty happy with my other all manual Chinese lens purchases, so I’ve got high hopes for the quality being pretty good. All the rest looks pretty standard so it just remains to be seen if the image quality compares to the Samyang/Rokinon 8mm diagonal fisheyes and the Meike Circular fisheye. Because it’s only just been announced, there aren’t any reviews available yet. It’s likely to be a bit like the Meike 6.5mm fisheye and take a little while before people start receiving them from China and putting samples up online. I’ve already placed an order for mine, so as soon as I get it I’ll do the usual unboxing and first impressions videos. Is anyone else thinking of picking one of these 7artisans 7.5mm fisheye lenses up for surf photography? Lens hood is removable…screws on. I have one. And the image quality is great with the exception of CA on the frame edges. Thanks Jeff, that’s great news. I’m still waiting for mine to arrive, it sounds like it will fit in my housing and offer a comparable alternative to my Samyang/Rokinon 8mm. Let us know if it fits in your V1 dome port Ben! It definitely does fit in the V1 dome, I’ve used it a couple of times now. I unscrewed the lens hood each time, not sure if it would fit with the hood on, but it’s very easy to remove the hood. I’ve now sold my Samyang 8mm fisheyes and just use this if I need a diagonal fisheye. 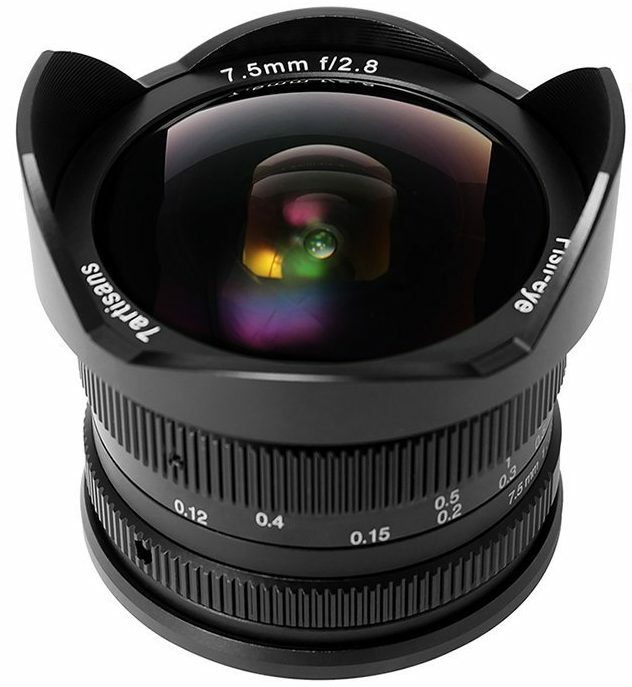 Hi Ben, I’m almost ready to order this 7artisans 7.5mm lens. As you use the a6000 housing, I was wondering if you could confirm that it will fit in the Sony a6500 Liquideye housing and which of the V1 or V2 dome / ports to use? Thank you sir! It’s the port designed for the V1 Samyang 8mm fisheye. It works great, I just unscrew the lens hood before putting it in the housing. Yes Dave it is quite normal as the 4910 is for the 8mm Samyang V2. For this new fish eye lens you will need the S-LD 4310 (originally designed for the 8mm Samyang v1) which is a little bit shorter. As the hood is removable will it fit inside the Meikon housing? Obviously their will be a degree of vignetting etc. I can source a Samyang secondhand for around the same price as the 7artisans… you mention image quality is virtually the same…which would you recommend as price isn’t an issue and I would also like to use it for Astro photography. I also have one eye on the new meikon housings with dome port which I assume would fit both lenses. Thanks in advance. I haven’t tried it in the Meikon housing, but I will do when I get back home on Sunday. I expect it would fit, but it would have some severe vignetting as you point out. They’re both f2.8, manual focus, and offer a very similar field of view, so neither has an advantage for astro photography. I have the V1 dome port for my Liquid Eye C6000 (as discussed in these comments) and it works perfectly with the 7artisans (with hood removed) and the Samyang V1. If you have a V2 dome for a Liquid Eye housing, or you have a Salty Surf Housing, you’ll be better off with the Samyang V2. The new Meikon housing looks like it has a relatively long dome port from the pictures, so there’s a chance the Samyang V1 and the 7artisans (and my favourite – the Meike 6.5mm circular fisheye) will be too short. If you can wait a couple of weeks I’m hoping to get the new Meikon housing as soon as I can (release date is start of February), and the first thing I’ll do is try my lenses in it and take some measurements of the ports so I can see which fisheye I’d recommend. yeah sweet I look forward to it, I really miss shooting with a dome port it always gives an added dimension to photos.